As you have read previously, the GATEways Project team has been working closely with researchers from Wildlife and Fisheries Biology to create a habitat for the native Western pond turtle at the far west end of the Arboretum. 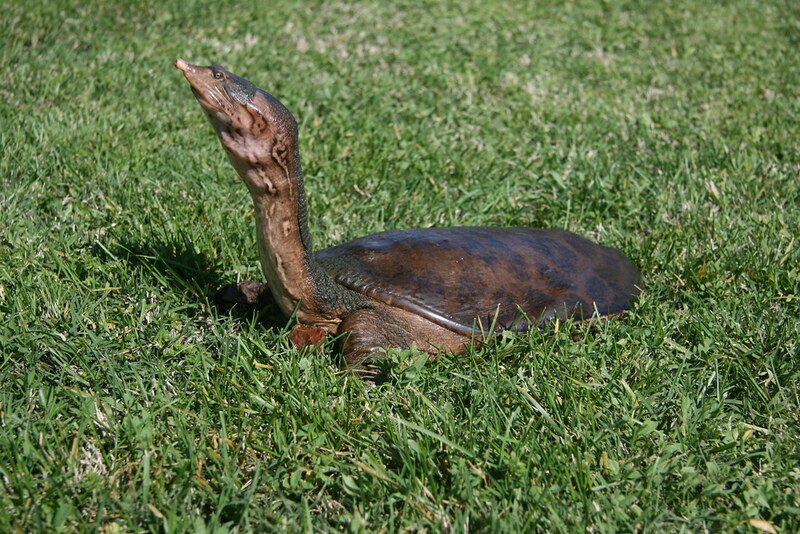 On a related note, researchers from the same lab were able to capture a non-native predator of the Western pond turtle which has been eluding capture while living in the Arboretum waterway for four (4) years–a wily Florida softshell turtle that they’ve named Piggle Wiggle Pipsqueak–an apt name once you’ve seen his unusual nose! They needed to find a home for this impressive creature, but not just any home. Piggle Wiggle Pipsqueak needed a pond of at least 20 square feet stocked with small fish to satisfy his dietary needs and they found one! Piggle Wiggle Pipsqueak now happily resides in a moat surrounding the lemur island at the Micke Grove Zoo, in Lodi. This story ended well, but the lesson remains…dumping any animal, especially non-native species, in the Arboretum, or anywhere, upsets our ecosystem and causes the animal (and our researchers) unnecessary stress!